The New Zealander capitalizes on a crash near the finish to surge ahead and sprint to victory in Wednesday's stage 2. ADELAIDE, Australia (AFP) — New Zealand time trial champion Patrick Bevin swooped in to take his first WorldTour stage and claim the overall lead in Australia’s Santos Tour Down Under on Wednesday. Bevin, 27, riding for the CCC Team, capitalized on confusion in the peloton sparked by a mass crash inside the final kilometer of the 122km second stage to power home in the finish. The Kiwi unleashed a sprint on the uphill, 700-meter finishing straight to reel in Spain’s Luis Leon Sanchez before holding off Australian star sprinter Caleb Ewan and Slovakia’s former triple world champion Peter Sagan at the line. The stage win gave Bevin a 10-second time bonus, lifting him into the overall lead of the race, five seconds ahead of Italy’s Elia Viviani, who won Tuesday’s stage 1 but could only manage seventh on Wednesday. Ewan is third overall, ahead of Germany’s Max Walscheid (Team Sunweb). 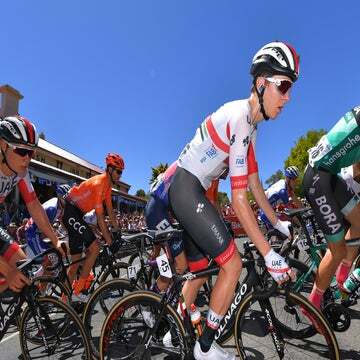 Walscheid finished 23rd in Wednesday’s stage through South Australia’s famous Barossa Valley wine country in scorching, 104-degree temperatures. Bevin, whose previous best in the season-opening race was 10th in 2016, avoided a pileup in the peloton which blocked the road to the Angaston finish line. The crash left around 25 riders to contest the finale, with Bevin surging from deep before dipping in behind Sanchez’s slipstream and crossing the line with enough time to clench his fists and raise his hands in celebration. His victory is the CCC Team’s maiden WorldTour victory and his first triumph outside of a national championship since winning stage 4 of Australia’s Herald Sun Tour in February 2015. Australia’s Jason Lea (UniSA-Australia) retained the king of the mountains jersey after stage 2. Viviani edged Bevin for the sprint leader’s jersey by a point. Thursday’s stage 3 launches from Lobethal into a challenging and hilly 6km circuit that finishes in Uraidla.